Tomorrow is the most auspicious Radhastami. 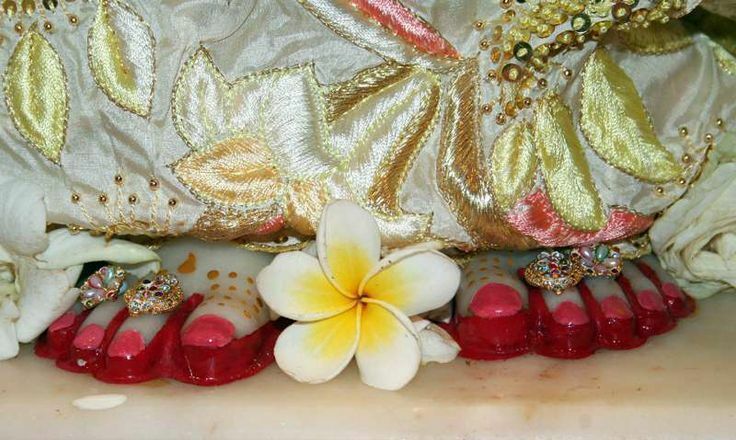 In my heart I place the splendid feet of Radha’s Lord, feet that eclipse the glory of autumn lotuses, are served by hosts of bumblebee sages, are marked with lightning and lotus and decorated with glistening golden anklets, and break the three sufferings of the devotees. Then, placing Her glorious transcendental form in (the womb of) King Vrishabhanu’s wife, Shri Radha descended into a great palace in a garden by the Yamuna’s shore. In the month of Bhadra (August-September), on a Monday that was the eighth day of the bright fortnight of the moon, at midday, when the sky was covered with clouds, (to celebrate Radha’s descent) the demigods scattered flowers that had blossomed in the Nandana gardens. Because of Radha’s descent the rivers became very pure and clear, the directions became auspicious and happy, and graceful, gentle, cooling breezes carried the pollen of lotus flowers. Gazing at her daughter beautiful as hundreds of moons, the gopi Kirti became happy. To bring auspiciousness she gave two hundred thousand cows in charity to please the brahmanas. Today is Radharani’s appearance day. So we should try to understand Radharani’s feature. Radharani is the pleasure potency, hladini-shakti. Änandamayo ‘bhyäsät (Vedänta-sütra 1.1.12). In the Vedänta-sütra the Absolute Truth is described as änandamaya, always in pleasure potency. That änandamaya potency… Just like änanda. When you want änanda, pleasure, you cannot have it alone. Alone, you cannot enjoy. When you are in the circles of friend or family or other associates, you feel pleasure. Just like I am speaking. The speaking is very pleasing when there are many persons here. I cannot speak alone here. That is not änanda. I can speak here at night, dead of night, nobody here. That is not änanda. Änanda means there must be others. So because Krishna, the Absolute Truth, is änandamaya, therefore eko bahu syäm, He has become many. We are also Krishna’s part and parcel, to give pleasure to Krishna. And the chief pleasure potency is Radharani. Actual aim of life is to satisfy Lord Vishnu, and Krishna is the origin of Vishnu-tattva. And He is pleased through Radharani. Therefore we don’t keep Krishna alone. No, Radha-Krishna. First Radharani. So that day is today. First you have to worship Radharani. Therefore in Vrindavan you will see all devotees, they will address one another, “Jaya Radhe.” Still. Because they know that “If Radharani is pleased, if I can please Radharani …” Radharani is presented, the original pleasure potency, always absorbed in thought of Krishna. So anyone who comes before Radharani to serve Krishna, oh, She becomes so pleased, “Oh, here is a devotee of Krishna.” She immediately recommends, “Krishna, oh, here is a devotee. He is better than Me.” This is Radharani . I may be a, not devotee. I may be most fallen rascal. But if I try to reach Krishna through Radharani , then my business is successful. Therefore we should worship Radharani first. That is our business. Instead of offering directly one flower to Krishna, you just put it in the hands of Radharani : “My mother Radharani, Jagan-mata, if you kindly take this flower and offer it to Krishna.” “Oh,” Radharani says, “Oh, you have brought a flower?” Krishna said, patraà puñpaà phalaà toyaà yo me bhaktyä prayacchati [Bg. 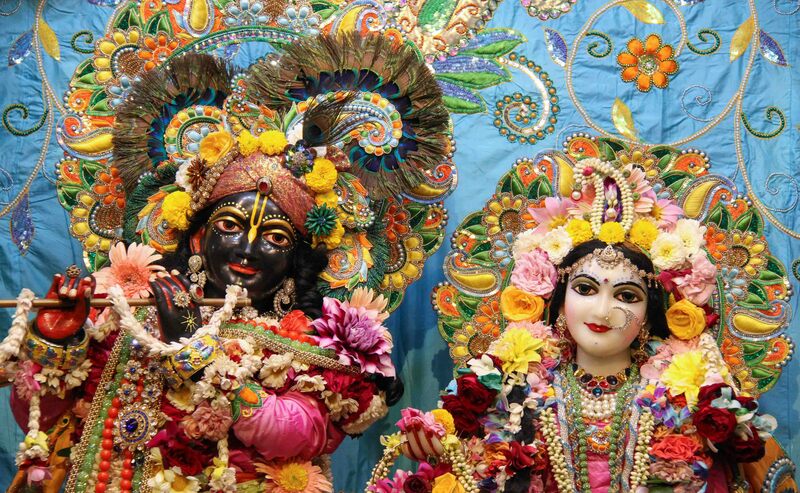 9.26], but don’t try to offer Krishna directly. Just offer through Radharani. It will be very much appreciated by Radharani. So this is our philosophy, to please Krishna through Radharani, and just today is the auspicious day of Radharani appearance. So we should offer pushpanjali and pray to Radharani that “Radharani , kindly be merciful and tell about me to Your Krishna. To Your Krishna. Krishna is Yours.” Krishna , Radha-Krishna. Krishna is not independent. Krishna is Radharani’s property. So you have to approach Krishna through Radharani. That is, today is the auspicious day. Worship Radharani very nicely and be happy. Radharani’s position: always feeling the separation. As Radharani is always in feelings of separation of Krishna, similarly, in the position of Radharani, Lord Caitanya was feeling separation of Krishna. That is the teachings of Lord Caitanya, feelings of separation, not meeting. The process of devotional service taught by Caitanya Mahäprabhu and His disciplic succession is how to feel separation from Krishna. That is Radharani’s position, always feeling the separation. The Gosvamis, they also, when they were in Vrindavan, they never said that “I have seen Krishna.” Although they were the most perfect, they never said that “I have seen Krishna.” Their prayers were like this: he rädhe! vraja-devike! he nanda-suno! kutaù. He rädhe, Radharani, he rädhe! vraja-devike! ca. Radharani does not remain alone. He (She) remains always with His (Her) friends, vraja-devé, Lalita or Vishakha and other damsels of Vrindavan. So the Gosvamis are praying, in their mature stage, when they were living at Vrindavan, they were praying in this way, he rädhe! vraja-devike! ca lalite! he nanda-suno! kutaù: “Where, Radharani, where You are? Where are Your associates? Where You are, Nanda-suno, the son of Nanda Mahäräja, Krishna? Where you are, all?” They were searching after. They never said, “I have seen Krishna dancing with the gopis. Last night I saw.” (laughter) This is sahajiyä. This is not mature devotee. They are called sahajiyä. They take everything very cheap—Krishna very cheap, Radharani very cheap—as if they can see every night. No. The Gosvamis do not teach us like that. They’re searching after. He rädhe! vraja-devike! ca lalite! he nanda-suno! kutaù, çré-govardhana-pädapa-tale kälindé-vanye kutaù: “Are you there under the Govardhana Hill or on the banks of the Yamunä?” Kälindé-vanye kutaù. Ghoñantäv iti sarvato vraja-pure khedair mahä-vihvalau. Their business was crying like this, “Where You are? Where You are, Radharani? Where you are, Lalita, Vishakha, the associates of Radharani? Where You are, Krishna? Are You near Govardhana Hill or on the bank of the Yamuna?” Ghoñantäv iti sarvato vraja-pure. So throughout the whole tract of Vrindavan they were crying and searching after Them, khedair mahä-vihvalau, as if madman. Khedair mahä-vihvalau. Vande rüpa-sanätanau raghu-yugau çré-jéva-gopälakau. So we have to follow the footprints of the Gosvamis, how to search out Krishna and Radharani, Vrindavan, or within your heart. That is the process of Caitanya Mahäprabhu’s bhajana: feeling of separation, vipralambha, vipralambha-sevä…..Not that very easily, “We have seen Krishna or seen Radharani in rasa-lila.” No, not like that. Feel the separation. The more you feel separation from Krishna, you should understand that you are advancing. Don’t try to see Krishna artificially. Be advanced in separation feeling, and then it will be perfect. Śrīmatī Rādhārāṇī’s earrings are the name, fame and qualities of Lord Kṛṣṇa. All glories to Srimati Radharani. This entry was posted in My spiritual Journey, Radharani and tagged appearance day of Radharani, feeling separation from Krishna, Garga Samhita, mood of Radharani, prayer to Radharani, Radha Ashtami, Radharani, Radhastami, search Radha Krishna in our heart, six goswamis of Vrindavana, Vipralambha bhava, Vrindavan. Bookmark the permalink.